Agartala, Aug 28 (IANS) The Centre did not support the tribals’ demand for a separate state in Tripura but would consider setting up a State Autonomous Development Council (SADC) if the state government so proposed, a Union Minister said on Monday. “The NDA (National Democratic Alliance) government at the Centre does not support the demand for a separate state in Tripura. 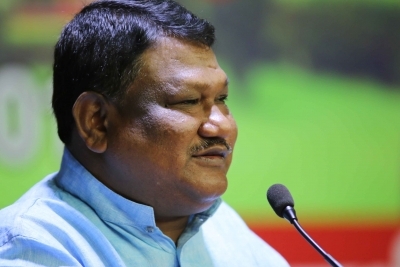 Instead, it will consider setting up the SADC if the Left Front government sent a proposal,” Tribal Affairs Minister Jual Oram told the media after a day-long visit to the state. Claiming that there was no development of tribals in Tripura, the Minister claimed the Tripura government had “misutilised” funds given by the central government for the development of tribals. He said the existing Tripura Tribal Areas Autonomous District Council (TTAADC) was functioning like a state government department in violation of the constitutional mandate. Accompanied by tribal leaders of Bharatiya Janata Party (BJP), the Minister said many tribal leaders who met him in northern Tripura had accused the state government of non-development of tribals. Several tribal parties, including Indigenous People’s Front of Tripura (IPFT), have been agitating for upgrading the TTAADC into a separate tribal state. TTAADC has jurisdiction over two third of Tripura’s 10,491 sq.km. area that is home to over 12,16,000 people, mostly tribals. The IPFT had blocked National Highway-8, the lifeline of Tripura, and the lone railway line in the state for more than 10 days from July 10 over their separate state demand, causing acute shortage of essential items. After intervention by the state and central governments, besides Governor Tathagata Roy, the IPFT lifted the blockade on July 20. Almost all political parties, including Communist Party of India-Marxist led Left Front, the Congress, Bharatiya Janata Party and other tribal parties, including Indigenous Nationalist Party of Tripura, have rejected the demand, saying it was not practical to divide the small state.